Unfortunately, this is not the photograph of the Bee patch itself: there were five positions across several panels where banana cables were piggy-backed five-high, routing control voltages hither, thither and yon. And, of course, many more spots where plugs were stacked two-, three-, or four-high, a symphony of brightly colored spaghetti strands. For a more detailed description of the constuction of the bee, bird, bee-thought sounds, the drone, etc., please continue reading. But first …. Ubi Mel Ibi Apes, along with my composition 3 seconds before Maia smiled, another song built around unique analog sounds from the Serge, are in the permanent collection of the SF Museum of Modern Art, as part of Glenn McKay’s lightshow installation, Altered States. What does this mean? It means I got my name on a wall not in a public restroom for once. Read Roy’s piece on the blue Serge & the Savoy Tivoli show here. 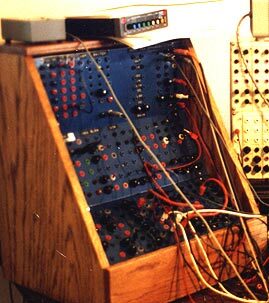 Roy, and collaborator Greg Jones, both students of Mort Subotnick, performed selections from their landmark electronic album No Imagination at the Savoy Tivoli in San Fracisco’s North Beach in the very early eighties using the blue and four-panel Serge systems. When they performed a piece of Roy’s, Forced – possibly the most acoustically violent piece of pulsed and gated white noise ever created- at top volume, the punk rockers in the audience went berserk and started screaming, pelting them with projectiles of various mass. It was not pretty. To be honest, I could empathize with the audience in this case. Forced was a brutal piece of music, an ear-shattering sonic onslaught. The beauty of the Serge systems is the great range of sonic texture, color, and expression one can coax from the open architecture. —It needs a space cricket sound to go with it. I got off the phone and fiddled around or a while, unable to construct a cricket sound to my liking. And suddenly, the thought popped in my head: No, it needs a bee sound. I will always be grateful for mr808 putting me on the insectoid path to satori. I played electron slides-and-ladders for the next week to create the sonic Bee and other audio components for the piece. In the picture above, we have (in the foreground) a Serge Touch Keyboard and a custom panel of oscillators and modifiers built by Rex Probe and crew at Sound Transform Systems in Oakland. I used the TKB for voltages to micro-tune the drone and also the filter cutoff and resonance for Atom Bee. On the panel behind the TKB I used the New Timbral Oscillator in conjunction with a Precision VC Oscillator to create the birdy sounds – modified only by a Roland Space Echo on the recording. The Bee was comprised of three separate sounds: the buzzing of the wings, the whoosh as the bee banks left and right, and the slightly exaggerated, distorted wing-stress sound as wingtip vortices create momentary turbulence. The four-panel box in the back was built by Serge Tcherepnin himself in the mid-seventies. On a later post, we will take a closer look at the panels, including the brown resin he poured over all the circuitry inside to protect his designs from copycats. 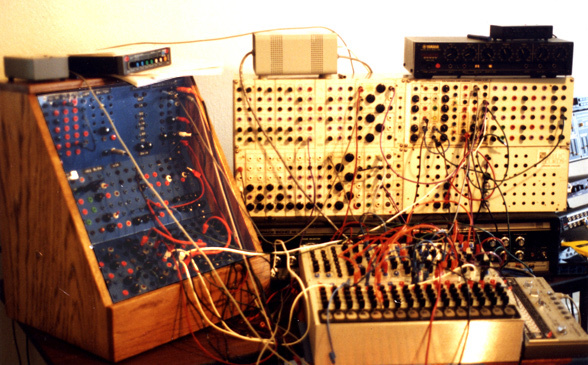 It was at one time in the experimental music department at Mills College in Oakland, Ca. They paid composer Greg Jones with as payment for writing a manual for their new Serge system. He paid me with it for designing a new logo for his company. The whole Bee patch ran non-stop for over two months in the Love Shack studio. I couldn’t turn the synths off because I was afraid that if any components cooled, it would affect tone, or pitch, or timbre. Finally, hearing the Fear in my voice, mr808 flew down from Portland and helped me record the song. He also recorded a 26 minute mix which I will post at a later date, with his permission. Recording of Flight of the Atom Bee was one live pass, mixed on the fly, using a noisy old Soundcraft mixer that had been used at Eli’s Mile High Club, a blues institution, in Oakland for many years. I hesitate to think how much whiskey and cigaret smoke adorned the circuitry of that board. We could only get one mono channel out in to this old Otari 8-track 1″ analog tape system, and even that was so noisy we had to do massive noise reduction when putting the cd together. I cannot find my picture of the Bee patch. A shame. I will keep looking.